They are celebrating their first birthday this week and the challenge is to choose your favourite face photo from the last month. It provided me with the perfect opportunity to revisit a photo that was lost amongst the Christmas craziness (photo taken December 12). This photo of Thomas just says so much about the magic of Christmas for a four year old. 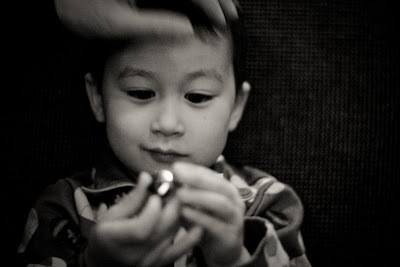 Santa gave him a tiny little bell on the Polar Express train ride and he was SO happy. A present. From Santa. Of course he was too scared to actually speak to the man in red, and sitting on his lap was out of the question, but when he looked at that little bell and I took this photo, I could see that it meant so much more to him than he let on. This entry was posted in Challenges, Photography, Thomas. Bookmark the permalink. Oh, that is just a perfect capture of the magic of Christmas for a little! I love it! Oh such a sweet capture, one he will cherish when he is grown. Very sweet picture, and what a lovely story!